The Governor of the Bank of England, Mervyn King, has today admitted that he lent Royal Bank of Scotland and HBOS £61.6bn in secret emergency funding in autumn 2008. Labour MP, and LEAP Chair, John McDonnell said he was “staggered” at the revelation. "I am staggered at the affrontery of the Governor of the Bank of England to risk £61bn of public money covertly, and without any accountability to Parliament. "At that time I expressed the concerns about the instability of a number of financial institutions and called on the Government to nationalise to stabilise, in order to plan the long-term rebalancing of our economy. This view was derided by the Chancellor and opposition parties but we now know the Government had pumped into these banks enormous sums of taxpayers’ money, seemingly without any enforceable conditions. "This is no way to run a finance sector, an economy or a government." 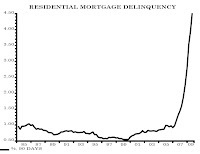 Nothing quite explains the current crisis like this graph of the rate of US delinquencies - households in serious arrears (over 3 months) with their mortgage payments. The graph covers the period between from 1985 to 2009. Until 2006, the delinquency rates never passed 1% of all households. Now it is 4.5% of US households who are at serious risk of losing their homes - and this excludes all those who have already been repossessed. As Graham Turner notes in his new book 'No Way to Run an Economy', more than 1 million US households received foreclosure notices between March and May 2009 alone. This demonstrates how the economic growth of the latest period of neoliberal capitalism was achieved by the loading of excessive debt onto households - the story is not dissimilar in the UK. The latest US delinquency figures, which came out last week, show that the Obama Administration's 'Making Home Affordable Program' (MHAP) has been a woeful failure. 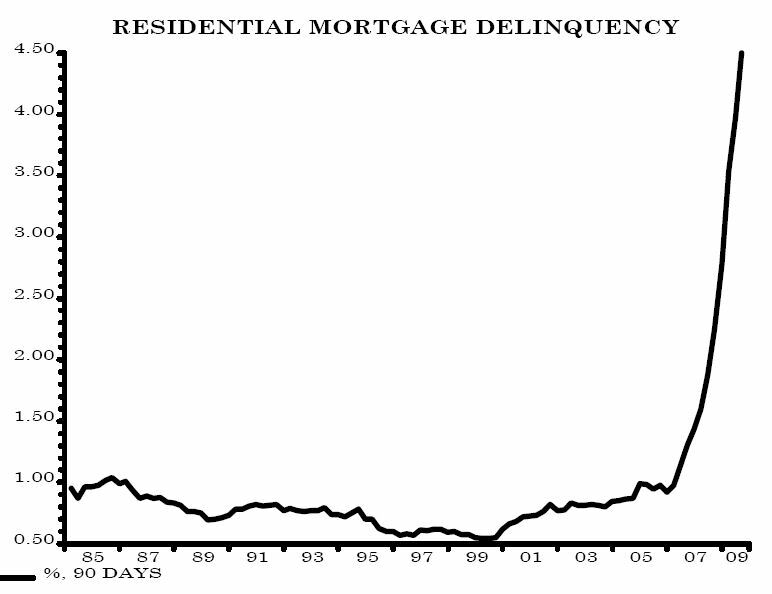 Serious delinquencies are still rising. This is a structural problem since MHAP does not offer a bailout to those at risk of losing their homes (after all bailouts are for banks with $billion turnovers) simply refinancing. Just as in the UK, banks and their shareholders are bailed out while hard-pressed people get tea and not much sympathy. Welcome to capitalism, the system that redistributes wealth from poor to rich. This week the Treasury confirmed that the government budget deficit had reached record levels of £11.4 billion last month. This bombshell means the experts have had to revise their estimate of what the annual deficit could pan out to be. A whopping £190bn is their calculation. Add to this collapsing tax receipts as the recession bites and the costs of having over 2.5 million people unemployed, and you're left with a major economic headache. The big three parties are all in firm agreement that reducing and eliminating the deficit are central priorities for the coming period, whoever is in office. The only difference between them is the timescale they have in mind. In the Queen's speech this week Labour introduced proposals for a Fiscal Responsibility Bill, which would commit it to cutting the deficit by 50 per cent in four years, while Vince Cable and Nick Clegg of the Lib Dems are calling for Gordon Brown to launch into "savage cuts." As part of his strategy to position the Conservatives as the party of economic responsibility, David Cameron is playing hardball. He's suggested that a Tory government would eliminate the whole deficit in one Parliament. Cameron's recent speeches referring to the iniquities of big government are crude attempts to lay down some semblance of justification for plans to cut public spending and reduce public borrowing. His big-government theme is reminiscent of the Thatcherite arguments of the 1970s and '80s, when the government pushed policies to "get government off people's backs." A return to economic growth could reduce the deficit, but even if the current recession is coming to an end, few would predict spectacular growth over the next few years. The Organisation for Economic Co-operation and Development is predicting no more than 1 to 2 per cent growth up to 2011. There is residual anxiety that the shaky US property market could still tip the British economy back into recession at any stage during this period. The only alternative available to reduce the deficit is to secure more tax revenues. But neither Labour nor the Tories are willing to increase taxes or take any serious measures to tackle the large-scale tax evasion and avoidance which are sapping our public finances to the tune of £150bn a year, according to the Tax Justice Network. This political consensus across the main parties holds out the prospect of public service cutbacks on a scale not seen in this country since the '30s. According to the Budget figures for 2009, the government's total managed annual expenditure is £671bn. Even if we allowed for the predicted 1 per cent growth in the economy over the coming years, any government aiming to wipe off £190bn debt within one period of office would have to launch a programme of cuts of £30-35bn per year for the five years of that Parliament. This would mean cutting 25 per cent of all government expenditure. People need to be made aware of what a 25 per cent cut in public services would look like. The Tories have made it clear that they want to cut the welfare benefits bill, particularly the dole and pensions. Cuts on the scale required to make any real impact on the deficit would require a cut in unemployment benefit, already the lowest in Europe, to £48 per week and raising the state retirement age to 69 immediately. This is what we are now facing as a result of an economic recession created by bankers, speculators, profiteers and their supporters in government. All the main political parties have decided that we will pay for this crisis, not the the institutions or individuals that caused it. Having used our money to stabilise the financial system, the government has stood back and allowed the speculators to return to business as usual. Bankers are in line to receive £6bn in bonuses this Christmas. But even if the main political parties are not willing to consider an alternative to this insanity, many people are. Ordinary people are still fuming at the bankers with their bonuses and the politicians with their expenses, who colluded to bring about this crisis and who are now colluding to ensure it is us not them that pay for it. The role of the People's Charter is to fill the vacuum left by the bankrupt strategy of these political parties. By setting out a straightforward analysis of the crisis, the charter provides an alternative view of causes of the unemployment and the threat to our public services that we are facing. By setting out a common-sense set of basic policies, the charter offers a way of developing an alternative strategy to take the economy out of recession in a way that could transform the future of our society. Already endorsed by trade unions, the TUC and enthusiastically supported by the Labour Representation Committee at its annual conference last week, the charter is beginning to catch the wind at a time when an alternative to the sterile consensus of the main political parties is desperately needed. The charter could be the benchmark by which people will decide how they cast their votes in the coming election. John McDonnell MP is Chair of the Labour Representation Committee. Nick Reilly, head of General Motor's international operations, is touring Europe on a mission. He's been to Poland and Belgium. Yesterday in England he met New Labour's august Lord Mandelson, the UK's First Secretary of State, Secretary of State for Business, Innovation and Skills, President of the Board of Trade and Lord President of the Council, and Tony Woodley, deputy leader of trade union Unite. Today Reilly is in Spain. Reilly is using the big stick of closure to threaten governments and unions. With massive overcapacity globally and car scrappage schemes ending, production cannot continue without huge additional bail-outs, reduction of capacity equivalent to three of the eight plants in Europe, and up to 10,000 job losses. Reilly's mission is to extract the best deal he can as part of the restructuring of one of the now bankrupt behemoths of the capitalist system of production and finance. GM was one of the biggest and most powerful of the global corporations that grew to dominate the world economy during the credit-induced boom of the second half of the 20th century. Together their power grew to the extent that it changed the role of government. To keep itself afloat, the sales of GM the vehicle producer, became increasingly dependent on the success of its own finance company GMAC – a hugely complicated operation providing insurance and mortgage services in around 40 countries as well as loans for vehicles purchased via its network of dealers. As the 2008 financial crisis swept the world, sending banks into a spiral of decline, GMAC was given permission to join their ranks as a bank holding company so that it could access funds from the US government's Troubled Assets Relief Programme, which it promptly did. In May this year GMAC was rebranded as the Ally Bank, because according to Sanjay Gupta, GMAC's chief marketing officer “it gives the sense of a trusted partner, the attributes we are trying to convey". Really? Operating in Britain as mortgage lender GMAC-RFC, the company was fined £2.8m by the Financial Services Authority (FSA) last month for mistreating customers who fell into arrears. It has also been told to repay £7.7m, plus interest, to 46,000 of its borrowers. After setting up as a mortgage business in the UK in 1998, GMAC-RFC grew rapidly to become one of the UK's largest mortgage lenders, but it stopped making new loans last year. The FSA's investigation of the company's lending practices between October 2004 and October 2008 found that charges for dealing with people in arrears were "excessive and unfair"; repossession proceedings were started before all other alternatives had been considered; GMAC staff were not properly trained in dealing with arrears cases and repossessions. Workers in plants throughout Europe and the rest of the world should not be reassured by the failure of the deal to sell Opel and Vauxhall to the consortium of Canadian parts dealer Magna and Russian finance interests. Neither should they place any faith in the ability of union leaders like Woodley to secure their future. The logic of capital is ruthless. The downward spiral into recession and slump cannot be reversed by low interest rates or injections of invented cash. GM's 25% production cuts will soon look small. GM workers should be preparing their own plans. They should discuss how to take over their industry, and convert their workplaces to production of zero-carbon vehicles as part of a massive expansion of public transport. Gordon Brown is in big trouble. The financial system he piloted to prominence during his years as Chancellor is in ruins. Rupert Murdoch has turned The Sun against him. The majority of the UK population is in favour of a withdrawal from Afghanistan, and his letter-writing skills have slipped, angering army wives and mothers. Brown’s plight is a pale reflection of the political crisis engulfing capitalist governments throughout the world as disaffection grips the masses whose lives are being destroyed by attempts to prevent a slump unparalleled in history. Despite trillions of stimulus dollars, pounds, euros, and the lowest interest rates ever set by central banks, unemployment is soaring worldwide. In an attempt to repair the damage to his reputation as warm-hearted saviour of the global economy, Brown is trying a populist appeal to the massed ranks of the Trades Union Congress (TUC) and the many other well-meaning members of the Stamp Out Poverty Coalition. At the weekend G20 meeting of finance ministers and central bankers in Scotland, Brown took up Brendan Barber of the TUC’s call for a tax on financial transactions within the UK – something within the powers of the national government, at least in theory. Having resisted the 30 plus year-old Tobin-tax campaign till now, the UK’s prime minister upped the stakes on the TUC, declaring his support for a tax on global financial transactions. The chorus of disapproval was almost deafening. The response from Barack Obama’s Treasury Secretary Timothy Geithner gave a clear and succinct voice to the objective force that is capital. Geithner said there was broad agreement that "growth remains the dominant policy imperative across our economies". US unemployment, which hit a 26-year-high at 10.2% in October, highlighted a "very tough economic environment" that will take a period of sustained growth to correct. "Government policy has to provide a bridge to growth led by the private sector," he said. "We're now in the middle span of that bridge." In an interview with Sky News, Geithner added: “A day-by-day financial transaction tax is not something we are prepared to support." Geithner, late of Goldman Sachs, insisted that government had to stay cautious (apart from giving bankers untold billions) and warned: “If we put the brakes on too quickly we will weaken the economy and the financial system, unemployment will rise, more businesses will fail, budget deficits will rise, and the ultimate cost of the crisis will be greater." In other words, business as usual is the goal. Canadian finance minister Jim Flaherty and Dominique Strauss-Kahn, the head of the IMF joined the opposition to a transactions tax. Flaherty said Canada was working out how to reduce taxes, while Strauss-Kahn opted for a politer more diplomatic response – it’s just too difficult to measure international transactions. Unsurprisingly the banks including Barclays and HSBC aren’t in favour either. All of the voices in this song-fest are united in their blind subservience to the status quo. The chorus against a tax on financial transactions shows two things. Firstly, reform of the global capitalist financial system is out of the question. Secondly the dependent relationship that links the state to the productive and financial components of the capitalist economy has to be shattered before we can move forward. The world is now ready for a society that places the satisfaction of needs as its primary goal. Rather than attempting to tax the proceeds of gambling in the global casino, the casino should be shut down and the capitalist state deconstructed. Geithner, Brown and the other apostles of capitalist growth have had their day. Lloyds Bank has been accused of "corporate arrogance" and forcing workers to pay for fat cats' mistakes after it announced plans to slash thousands of jobs. In a fresh wave of cuts designed to reduce costs, Lloyds Banking Group will axe up to 5,000 jobs across the country next year within the group-operations, insurance and retail sectors as a result of a series of reorgnisational moves. Lloyds has already cut around 10,000 jobs since it took over the failed Halifax Bank of Scotland (HBOS) at the end of last year to form a "superbank." The impact of the recession caused the government, which holds a 43 per cent stake in the bank, to bail it out to the tune of £17 billion. And only last week the government announced a further £5.7bn investment. Left Economics Advisory Panel (LEAP) chairman John McDonnell MP said: "The government has just handed another £5.7bn in public money to Lloyds and within a week the bank has announced a further 5,000 job losses. "This is another slap in the face for the Chancellor and is another reason why we have consistently called for full nationalisation and public control so that public money is not used to subsidise job losses and bankers' and shareholders' greed. "Yet again this demonstrates that it is the working people who are paying for this recession while the bankers profiteer." Unite national officer Rob MacGregor has called on Lloyds to put all job losses on hold until it agrees not to enforce any compulsory redundancies. He said: "This announcement of 5,000 job losses demonstrates the depth of corporate arrogance within this taxpayer-supported bank. "This country's financial sector should be looking towards the future rather then continuing to slash jobs without proper consideration of how to rebuild the public's confidence in our tarnished banking sector. "Today marks the start of another dark week for finance workers. "The government cannot afford to continue to look the other way as hard-working families are punished in this manner." Ged Nichols, general secretary of the Accord union which represents the largest number of former HBOS staff now working for Lloyds, added: "We always recognised that some job losses were inevitable as Lloyds TSB integrated HBOS operations, but the scale of the changes will leave many staff in shock. "Some of those who are affected will have a long wait before anything definite happens and they may find the uncertainty very difficult to cope with." But a statement from the bank has argued that the cuts will be "significantly mitigated." Lloyds group integration director Mark Fisher said: "We have mitigated the impact on positions through redeployment and the release of contractors and temporary staff." Tobin Tax conversion by Brown? At the G20 Summit, Gordon Brown has suggested a Tobin Tax (a tax on financial transactions) to pay for the global bank bailouts and deficits. This came as a massive shock not only to other global leaders, but to all those who have been campaigning for such a tax for several years. At Prime Minister's questions less than a year ago, Alan Simpson MP suggested a Tobin Tax to "deter speculators from playing the terribly destructive role that they have played in throwing us into the current recession". Brown's response was that a Tobin Tax "has been found by many people who have looked at it not to be implementable". Just a month before that another Campaign Group MP - Neil Gerrard - was dismissed by Treasury Minister Stephen Timms who said, "The Government have previously studied the technical implications of a proposed tax on sterling currency transactions and reached the view that there would be economic distortions across a range of activities beyond just the foreign exchange markets, the cost of which would be likely to far outweigh the relative costs of raising finance via other mechanisms that Governments use". No one has yet explained Brown's Damascene conversion. Nevertheless, the severity of the UK's deficit caused the ongoing bank bailouts means that the time is exactly right to consider a tax that could raise billions from the finance sector. Surely logic hasn't reached Brown's thinking? In the run-up to the 2012 London Olympics, the New Labour government has put in a credible bid for victory in the financial events with the sums spent on bailing out the banks. The increasing size of the bail-outs shows one thing – the crisis is getting worse rather than better. The Royal Bank of Scotland has so far received a world-record £53.5 billion since the onset of the crisis in 2007. That accounts for most of the total of £74 billion of taxpayers’ money the government has put into the banks, including Lloyds and HBOS, over the last two years. The latest £25.5 billion for the RBS announced by Chancellor Darling yesterday is part of a second bank bail-out which adds up to nearly £40 billion, which is more than the amount handed over in 2008. The government is hoping this will keep the banks afloat whilst they tear themselves apart under direction from the EU’s competition commission. The dismemberment of systemically important “too-big-too-fail”’ banks is a hot topic for the world’s financial community, but there is no agreement on a co-ordinated package of regulation and reform. Some want to return to the regime established in the wake of the 1929 crash which separated high-risk investment – gambling – from the relatively safer, but less profitable business of balancing deposits and lending. Others, like the IMF, are busy trying to work out how to reduce the grossly unsustainable government deficits resulting from attempts to prevent global meltdown. All of the schemes under discussion concentrate their attention on repairs to the financial system. None of these can work however. Martin Wolf, the Financial Times’ leading commentator puts it starkly: “It is idiotic to discuss the reduction of the huge fiscal deficits, without considering the nature of the offsetting adjustments in the private and external sectors.” What he implies is that the financial system can’t be fixed without an “extremely perilous” return to credit-led growth. Yesterday the Indian government gave its verdict on the health of the global economy. It swapped $6.7 billion of its US paper dollars for 200 tonnes of gold bullion put up for sale by the IMF. This is the latest and strongest indication that the Asian countries are moving away from a reliance on the declining dollar. India’s finance minister couldn’t have put his reasons clearer. He said the economies of the US and Europe have collapsed. The contradictory movement of the tectonic plates of the capitalist financial and economic system is producing seismic shocks throughout the world. Even its most ardent defenders are losing faith in the possibility of a “solution” that is anything but an attempt to repeat the past. Warren Buffet, the capitalist system’s most long-standing and successful investor of other people’s money has just bought a US railroad, in his biggest ever deal, describing it as “an all-in wager on the future of the American economy”. Burlington Northern Santa Fe is a freight company. Its biggest cargo is coal for power stations. So much for concern about global warming. Profit-motivated growth has brought us to an historical crossroads. The capitalist road leads to economic destruction, warfare and the collapse of life-support systems. If the historical process could speak to us directly, it would surely urge humanity to move forward to a co-operative social set-up where a financial system that serves only shareholders and speculators is put out of its misery and corporations that plunder the planet become the property of the people as a whole. I've just got back from the launch of Graham Turner's new book No Way to Run an Economy at Bookmarks, the socialist bookshop. Thanks to getting an advanced copy I had read all but the last two pages before the launch began (I read the last two pages on the tube back to Charing Cross - like the rest of the book they were excellent). Graham says he wrote the book - the follow up to The Credit Crunch - out of frustration at the inept handling of the economic crisis (the book is subtitled 'why the system failed and how to put it right') in the UK and US in particular - the book is scathing about the incompetence of the Obama Administration's response. Turner highlights the misinterpretation and ignorance of Keynes that has exacerbated the current crisis, but also uses Marx to highlight the systemic failings and contradictions in modern capitalism. As Graham joked, "I've heard me be described as a Keynesian because I sometimes use Keynes to demonstrate what's wrong. I've also cited Friedman, does that make me a monetarist? I'm an economist: Marx is useful at looking at the structural problems". The book does indeed look at the failings of central banks in the US, UK and EU - and invokes Keynes to highlight their mistakes. Likewise though the strength of this book is the more in-depth look at the structural failings and a Marxist critique of neoliberalism. In utilising these two analyses Turner demonstrates an understanding of today's globalised economy that few policymakers have grasped - and it highlights not only what a superb analyst Graham has been throughout this crisis, but how such a thorough understanding of the economy has informed that analysis. This highly readable book is a comprehensive overview - packed into under 200 pages - of our economy and its current malaise by the most astute chronicler of this economic crisis. Buy it now - and do so from Bookmarks.